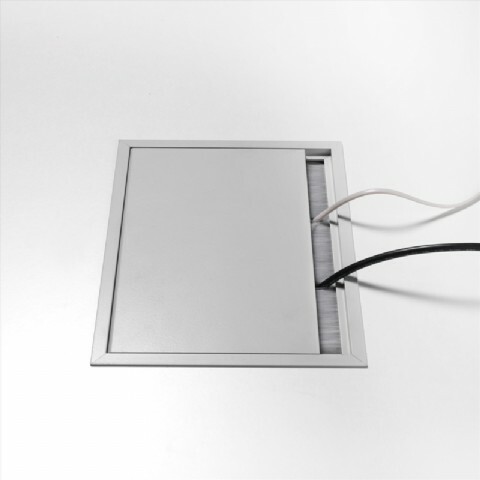 A range of Hinged Access Plates with Brush Lining in a number of different profiles, ideal for Boardroom Tables, and Reception Counters - and in fact anywhere where Power and Data need to be hidden just below the worktop! With it's quality metal design, it comes in a variety of sizes and has a hinged top section, meaning you won't have any tops floating around on the desktop, minimising the risk of scratches etc. Just router a Rectangular hole and this unit drops into place just like an oversize cable port and although many of our customers just supply this unit and leave the electrics to the client, we have a range of electrics specifically designed for this unit if required.